Prepare cake mix according to package directions and fill cupcake liners with batter. Bake in preheated 325°F oven or about 20 to 25 minutes. Make strawberry mousse: Melt 8 DOVE® PROMISES® Dark Chocolate in microwave in 20 seconds intervals. Beat chocolate with milk, whipped topping powder and preserves until fluffy. Fill pastry bag fitted with star tip and pipe mousse onto cupcakes. Melt remaining DOVE® PROMISES® Dark Chocolate in microwave. Dip strawberries in chocolate and place on waxed paper-lined pan; refrigerate until set. Spoon any remaining melted chocolate into resealable plastic bag with snipped corner and drizzle over strawberry mousse. 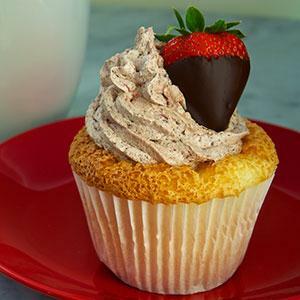 Top cupcakes with chocolate-dipped strawberries, or serve them on the side. Yield: 24 servings. Combine 2 1/2 cups flour, 1/2 cup sugar, yeast and salt in bowl . Place 3/4 cup butter, milk and water in 1-quart saucepan. Cook over medium heat until very warm (120°F to 130°F). Add milk mixture and egg to flour mixture. Beat at medium speed, scraping bowl often, 2-3 minutes or until smooth. Stir in enough remaining flour to make dough easy to handle. Combine 1/2 cup sugar and cinnamon in bowl. Punch down dough. Roll dough into 16×14-inch rectangle on lightly floured surface. 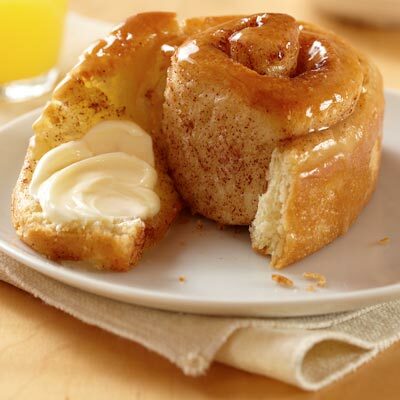 Spread dough with 1/4 cup softened butter to within 1/2 inch of edges; sprinkle with sugar-cinnamon mixture. Roll up, jelly-roll fashion, beginning with 16-inch side; seal seam well. Cut into 16 (1-inch) rolls with serrated knife. Place rolls in 2 greased 9-inch baking pans. Cover; let rise about 30 minutes. Bake 25-35 minutes or until golden brown. Remove from pan. Cool completely. Combine 1 tablespoon butter and honey in bowl; mix well. Brush glaze over rolls. Serve with Butter with Canola Oil. Meanwhile, place ginger and 2 tablespoons sugar in a small food processor; cover and process until finely chopped. In a large bowl, combine the flour, 1-1/4 cups sugar, baking powder, salt and ginger mixture. In another bowl, whisk the egg yolks, eggs, oil, water and extract. Add to dry ingredients; beat until well blended. Add cream of tartar and remaining sugar to egg whites; beat with clean beaters until stiff peaks form. Fold into batter. Gently spoon into three ungreased 9-in. round baking pans. Cut through batter with a knife to remove air pockets. Bake on the lowest oven rack at 325° for 22-26 minutes or until cake springs back when lightly touched. In a large bowl, beat butter until fluffy. Add the confectioners’ sugar, milk, extract and salt; beat until smooth. Place bottom cake layer on a serving plate; spread with 1 cup frosting. Repeat layers twice. Frost sides of cake with remaining frosting. 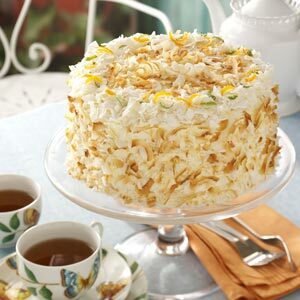 Press coconut over top and sides of cake. Garnish with orange and lime peel. Refrigerate until serving. Yield: 16 servings. Spoon a heaping tablespoon pie filling down the center of each crepe. Fold sides of crepe over filling; place in two greased 13-in. x 9-in. baking dishes. Bake, uncovered, at 350° for 10-12 minutes or until heated through. 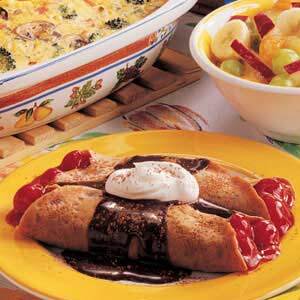 Transfer to serving plates; drizzle with warm chocolate sauce. Yield: 10 servings (20 crepes). Editor’s Note: Unfilled crepes may be covered and refrigerated for 2 to 3 days or frozen for 4 months. Melt 2 Sauté Express® squares in 12-inch nonstick skillet over medium heat; add chicken. Cook, stirring often, 5-6 minutes or until golden brown and cooked through. Remove from pan; keep warm. 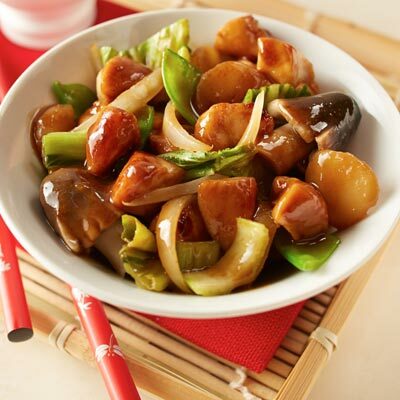 Melt remaining Sauté Express® square in same skillet over medium heat; add snow peas, onion, mushrooms and water chestnuts. Cook 2-3 minutes or until onion and snow peas are crisply tender; add bok choy. Cook 3-5 minutes or until greens are wilted and stems are crisply tender. In a large saucepan, combine the sugar and flour. Stir in cream until smooth. Cook and stir over medium-high heat until thickened and bubbly. Reduce heat; cook and stir 2 minutes longer. Remove from the heat. Stir a small amount of hot filling into egg yolks; return all to the pan, stirring constantly. Cook and stir until mixture reaches 160°. Remove from the heat. Gently stir in ice cream and vanilla until ice cream is melted. Place plastic wrap over the surface of the sauce; cool. 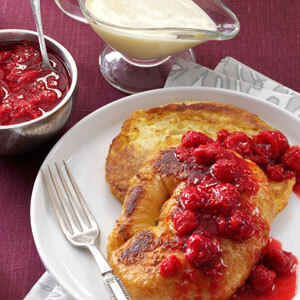 For berry sauce, combine raspberries and sugar in a saucepan. Simmer, uncovered, for 2-3 minutes. Remove from the heat; set aside. In a shallow bowl, beat eggs. Dip both sides of croissants in egg. On a griddle, brown croissants on both sides in butter. Serve with vanilla and berry sauces. Yield: 4 servings. Bake cake as directed in a 9 x 13 pan and let cool completely. Crumble cake up into a large bowl. Soften frosting for 10 seconds in microwave. Add frosting to crumbled cake and stir with a fork until frosting disappears and is completely incorporated into the cake crumbs. Test your mixture by picking up a handful and squeezing it together. It should hold together without breaking apart. If mixture is too dry, add more frosting. Roll mixture into walnut-sized cake balls and transfer to a wax paper lined baking cookie sheet. Make sure balls are tightly packed and look smooth with no cracks. If they appear cracked, you may need to add more frosting. Transfer cookie sheet with cake balls to freezer or refrigerator for 15 to 20 minutes. Place 16oz. of the candy melts in a small, deep microwave-safe bowl. Microwave in 30-second bursts, stirring each time until completely melted. The melted coating should coat a spoon but still be able to slowly drip off. If coating is too thick, add shortening or vegetable oil 1/2 teaspoon at a time. Do not exceed 2 teaspoons per 16 ounces of candy coating or the cake pops will crack. Remove cake balls from freezer. 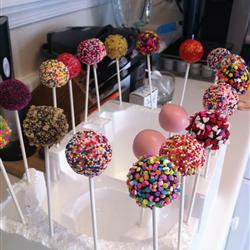 Dip tips of lollipop sticks into candy coating and insert sticks no more than halfway into center of your cake balls. Let them set for 1 to 2 minutes, resting on the cake ball, sticks in the air. If decorating your cake pop, add your sprinkles, nuts or candy right after dipping, before coating dries. Poke stick of cake pop into Styrofoam block to stand up straight and dry completely, about 5 minutes. Make sure your Styrofoam block and all sprinkles, nuts and decorations are ready to go before you start dipping your cake pops. The candy coating hardens within a minute, so you have no time to lose! For decorations, check your local craft store or baking aisle at the grocery store for colored sprinkles nuts and candies. You can also use M&M’s, chocolate chips, colored sugar, or coconut. If you want to draw on your cake pop, you can buy decorating pens. They work like markers but are food safe, with edible ink.